The Minister for Finance will propose a ground-breaking restructuring of the banks today as the results of Central Bank stress tests will signal the virtual nationalisation of the Irish banking sector. 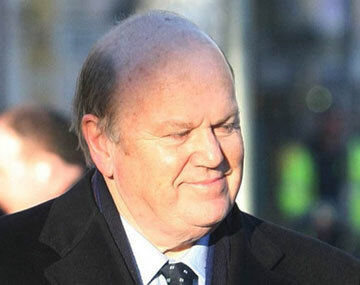 The results of the tests will lead Michael Noonan to undertake “a radical new approach” to fix the banks, a Government source said. The Central Bank sought the suspension “to avoid the possibility of a disorderly market due to the circulation of information or rumours during the day”. The proposed sale of building society EBS to the Cardinal private equity group was halted yesterday after the Government said the consortium’s bid was “not sufficiently commercially attractive” to the State. Cardinal had planned to invest €600 million in EBS but the Government was uncomfortable with the potential cost of future unexpected losses under its proposal. The Cardinal consortium expressed its “extreme disappointment” at Mr Noonan’s decision. Senior European sources said last night that the final scope of the tests was a “done deal” following prolonged talks between the Central Bank and the bailout troika of the European Central Bank, the EU Commission and the IMF.